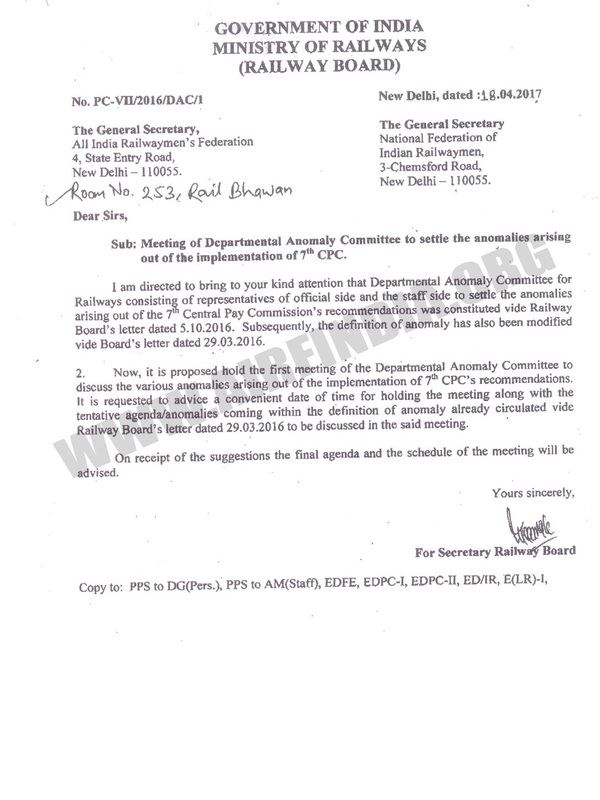 I am directed to bring to your kind attention that Departmental Anomaly Committee for Railways consisting of representatives of official side and the staff side to settle the anomalies arising out Of the 7th Central Pay Commission’s recommendations was constituted vide Railway Board’s letter dated 5.10.2016. Subsequently, the definition of anomaly has also been modified vide Board’s letter dated 29.03.2016. 2. 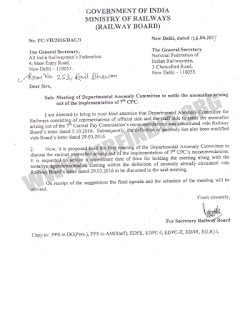 Now, it is proposed hold the first meeting of the Departmental Anomaly Committee to discuss the various anomalies arising out of the implementation of 7th CPC’s recommendations, It is requested to advice a convenient date of time for holding the meeting along with the tentative agenda/anomalies coming within the definition of anomaly already circulated vide Railway Board’s letter dated 29.032016 to be discussed in the said meeting. On receipt of the suggestions the final agenda and the schedule of the meeting will be advised.